Chris Anderson has a knack for spotting trends and acting on them. After all, he spent nearly 12 years familiarizing readers with the inner workings of technology as editor of "Wired". In this interview, we follow the author of "The Long Tail" down the stream of thought that led to his latest venture: making drones ubiquitous. Journalist, entrepreneur, visionary: After a stint at "The Economist" and going on to serve as editor-in-chief of groundbreaking and agenda-setting magazine "Wired" and writing three influential books – including "The Long Tail: Why the Future of Business Is Selling Less of More", which offered readers fresh insight into how business can be done on the internet – Chris Anderson is now helping shape the future by tackling technology hands-on as the CEO of "3DR", a company putting drones front and center for commercial exploitation. Here he talks about how low barriers and open-source tools are vital to getting your ideas out there. GOING SOLO: Anderson with 3DR's Solo, the world's first smart drone. 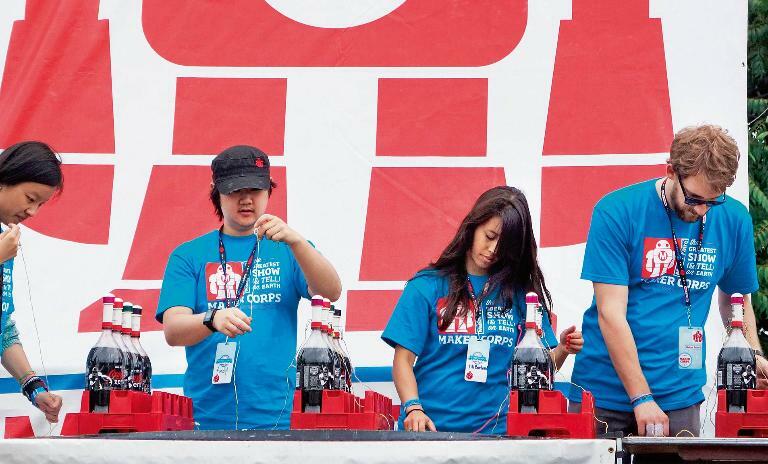 MAKERS UNITE: The "Maker Faire" calls itself the "Greatest Show (& Tell) on Earth". It holds fairs around the world, including this one in New York in 2013. 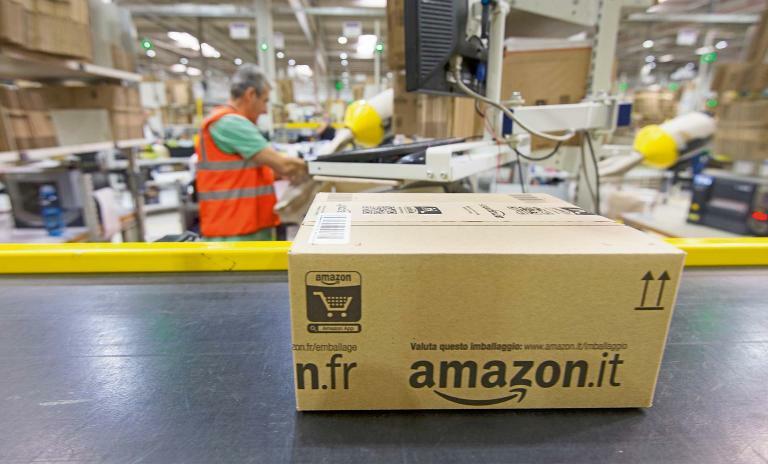 CASE IN POINT: Amazon has made a long tail business strategy the focus of its success. You are often described as a visionary or a utopian – or even a guru. What do you make of that? Those are all terrible terms. I never use any of those. That’s not what I intend to do. It’s really simple: I just happen to be lucky to live in an interesting place in an interesting time, surrounded by interesting people. And I tend to do rather than just watch – and when you do things with interesting people, trends become obvious. There’s no intention to trend-spot, they just kind of jump up in front of you, and you can’t ignore them. "When you do things with interesting people, trends become obvious. They kind of jump up in front of you." In reviews of your books there’s often an undertone among critics that you’re over-optimistic about the future. That’s just the standard line about Silicon Valley. Everything I’ve written has been completely obvious to people around me, and considered either wrong or outrageous or optimistic by those who don’t live in the technology industry. The notion that something is over-optimistic is basically the slander applied to computing for about 50 years – it’s just normal. I think it was William Gibson who said, "The future is already here, it’s just not very evenly distributed." It’s been over 10 years since you published "The Long Tail", a powerful idea at the time that explained how internet retailers were beginning to concentrate on the "tail" of niches as a new market, rather than trying to find hits. How do you think the notion has played out? It’s played out exactly as expected. I didn’t invent the concept, it was already playing out, and it’d been playing out for years. I just put a name on it. It’s like asking: "How’s gravity working out?" You know, it worked! The "Long Tail" is basically a statistical observation about humanity. It’s an old phenomenon that’s just been amplified by the internet and the ability to extend it to more domains and more markets so we can measure it better. But it’s deeply wired in our biology and it’s probably been true for about a million years. The internet exposed the latent demand for choice. We didn’t have the mechanical ability to expose people to choice until the internet opened that up. Warren Buffett recently predicted that AI would be "enormously disruptive" for the economy because of the loss of jobs it would entail. Do you ever feel like new technologies sometimes present dangers? Well, the way you stated the sentence is all in absolutes, and of course the one absolute is that there are no absolutes. Will new technologies destroy jobs? Of course. Will new technologies create jobs? Absolutely. Is the latter greater than the former? You know, over time it tends to be. I don’t see any reason why it wouldn’t be this time. We’ve got about 300 years of experience, going back to the plough, and so far so good. But is the pace of upheaval accelerating, so we’re constantly having to adapt quicker than we used to, as a species? Yes, we are. Are you suggesting we’ve reached some sort of metabolic limit to our ability to adapt? Maybe. I haven’t seen it. In 2012, you described a very optimistic vision of what it meant to be an entrepreneur, where much of the infrastructure, such as distribution and fundraising, can now be done online. Do you still feel that way in 2017? Or has something changed? Well, let’s be precise: Are the barriers to entry for entrepreneurship lowering? Yes. Are they continuing to lower? Yes. Those barriers include regulatory, technical, team building, fundraising. All those things are continuing to lower thanks to open-source software, or global markets, or crowdfunding and so on – so all that’s continued. Then when we look at the incentives to entrepreneurship, the question is: How do they compare to a safe job at a good company in good economic times? So we can believe that the barriers continue to fall, but the incentives vary, based on the alternatives. I’m sure there are cycles, but right now all the metrics suggest there have never been more startups created, never been more startups funded. Venture investments are close to an all-time high. Chris Anderson built two successful careers in the space of a decade. The former editor of "Wired" magazine set out his stall in 2006 with the book "The Long Tail: Why the Future of Business Is Selling Less of More". This much-discussed bestseller showed how the new distribution models of the digital age had enhanced an old retail truth – that selling a few of a large number of items can sometimes beat the blockbusters. Two more books followed, the last of which, "Makers: The New Industrial Revolution", served as the theoretical backdrop for his second career as an entrepreneur in the burgeoning consumer drone market. 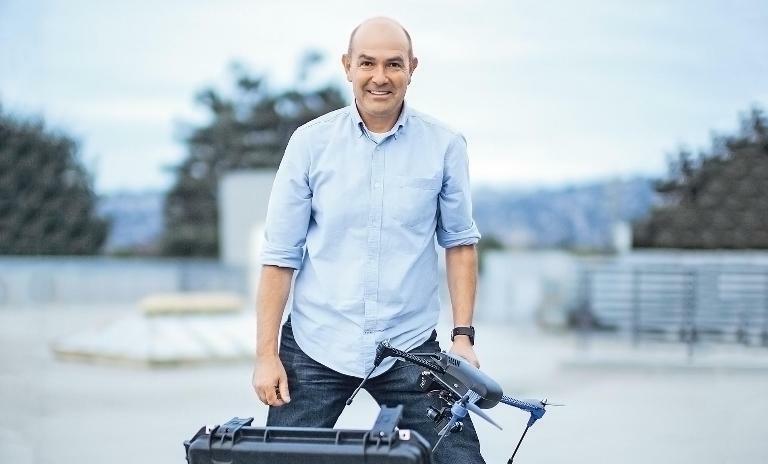 From being a "maker," Anderson went on to become co-founder and CEO of "3DR", a leading developer of drone software. Isn’t there a danger that digital entrepreneurs of the type you describe in the book "Makers: The New Industrial Revolution" will only end up making luxuries rather than necessities? That necessities will still be made in China, while American tinkerers make luxury items for niche markets? There’s certainly something to that, but I don’t think that’s an economic trend. Makers are always continuing from amateurs to professionals, or from dabblers to obsessives. We have the "Maker Faire" here in the Bay Area. Around 120,000 people attending are all going to be doing their own thing. All that stuff will fall into three categories. Number one: It’s things that they all did themselves. Number two: It’s something that probably did not exist before. And number three: It’s probably of such narrow interest that the only explanation for why it exists is "because I can." "The great liberating thing about the maker movement is that you don’t really need a good reason to do anything." But it doesn’t necessarily pass any economic test. Why would anyone else want it? Where are you going to sell it? How do you compete with China? A fraction of those makers might have aspirations to entrepreneurship, and they’re going to have to ask those tough questions about market size, distribution and building materials, etc. But that’s the minority. The great liberating thing about the maker movement is that you don’t really need a good reason to do anything. When the cost of creation is so low, you don’t have to overthink stuff. You can just do it and see what happens, and let the marketplace pull you into entrepreneurship, rather than falling in love with a dream, pursuing it obsessively on your own for years, releasing it into the world to a giant shrug and then having your spirit crushed. Was it similar when you started your companies? Always. I got pulled into all this. I just did stuff, and most times people ignored it. Every now and then people liked it, and when they liked it I made more of it. Every weekend I do projects –sometimes doll houses with my daughters, sometimes software, or electronics, or mechanics. Every weekend it’s a struggle and I’ve accomplished something – or not. And I’m like: "Okay, does that feel like I want to do more of it, or not?" And sometimes I’m like: "That was hard. I don’t like doing that. I’m going to stop." And sometimes I’m like: "That was actually amazingly cool. I had no idea I was going to get so far – I think next weekend I’ve got to do more." It’s like raising kids: It’s full of failures and struggle, but the occasional successes are so inspiring that they’re worth everything else. Is there anything you’ve learned from running 3DR that’s made you question some of the things you were writing when you were a writer? Absolutely, yes. And the book to test it against is "Makers", which was written before I came on full-time at "3DR". When I wrote it (in 2011) I was still the editor of "Wired". The memory of starting the company at my dining room table with my children was still pretty fresh and I still had one foot in the garage and the maker movement. You could see how we got there, but what was less clear was how to get from five to 50 to 100 employees – you know, the scaling part. 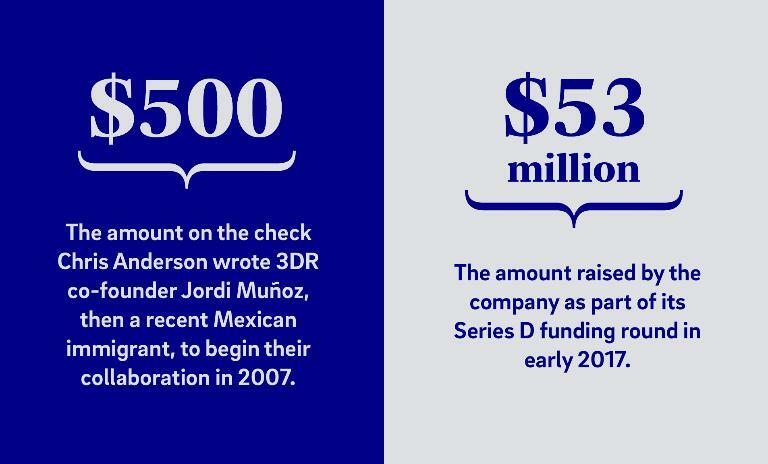 The company’s name refers to a third axis where consumer robots hadn’t yet traveled, something Chris Anderson and Jordi Muñoz vowed to change when they founded 3DR in 2009. They launched the first smart drone, Solo, in 2015. Site Scan, a complete aerial analytics package, followed in 2016. I had a thesis that you could scale the maker movement into a big traditional company. And I think that thesis turned out to be wrong. I knew that, on the manufacturing side, there was a discontinuity in terms of scale – you couldn’t just scale bigger and bigger garages, if you will. But the discontinuities went beyond even that. For example, the difference between selling online and selling through traditional retail – involving distributors and price protection and marketing and inventories sitting out there in other people’s warehouses. That, right there, is a completely different business model, and one that the garage doesn’t train you for. The other thing we weren’t trained for was this: We knew that China would be strong and the speculation was that by open-sourcing software you could leverage Chinese hardware manufacturers and create a kind of Android-like ecosystem. That thesis may still be true, but it has not been proven true yet. What future tech trends are you seeing now? I started the website "DIY Drones" 10 years ago, and that kicked all this off. The question there was that drones had been around for 50 years and sold by big aerospace companies and used in the military, so what made me think that a bunch of amateurs with a website could do anything truly innovative? And the answer was that the enabling technologies of drones – sensors and smartphone guts, GPS and cameras and so forth – were now so good and cheap that you could come at the industry from the bottom up rather than having to create a traditional aerospace company. And that worked out really well. There are already millions of drones in the air, and they’re all made by companies like ours. Now we’re doing the same thing with cars 10 years later. A sister site for "DIY Drones" is "DIY Robocars" (an ideas forum for building robot cars) and the question is: What could you amateurs possibly do that the Googles and Teslas and Ubers can’t do better? And the answer is: Well once again, we can come from the bottom. Cheap, open, easy, unreliable – unreliable is a good thing because it means you don’t have to spend all your time obsessing over regulations and safety because the cost of failure is so low. You might look at it and think: "Those are toys." Until you look closely and realize it’s the exact same software that’s used on the big cars, but because it’s open source, the cost of entry is so low you can do it for a couple of hundred dollars on the weekend. It’s the same democratization – you can transform traditional industries by simply opening them up. 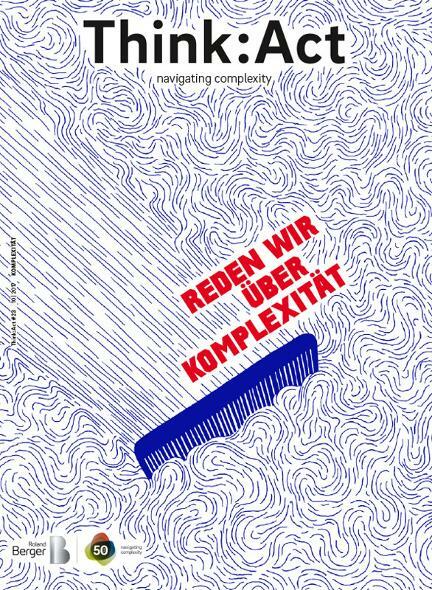 How smart can a city get? Will China be the new Superpower? Don't miss our article with Nobel Prize winner Richard Thaler, as well as much more food for thought.